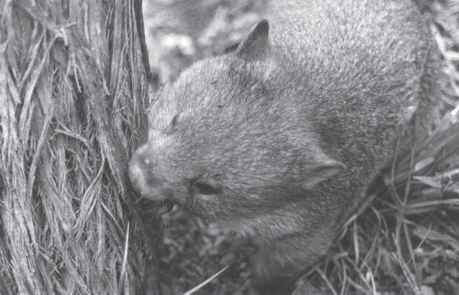 During its travels through the night, the wombat uses mostly well-worn paths. If the undergrowth is heavy, these will take the form of tunnels through the vegetation, wombat-high and wide, or a little larger if they are also used by wallabies, as often happens. In more open country there are also well-trodden paths used by a variety of animals, and although the wombat may wander off the path while grazing, it usually regains the path before moving on to a new area. If there are man-made tracks or roads along the way, these will also be used for as long as their direction suits the one chosen by the wombat. Although it has the reputation of being slow, this is actually true only when the wombat is moving short distances, grazing from tussock to tussock, for instance. More often it covers the ground remarkably quickly, as anyone who has tried to follow a wombat through the bush has found. In the slow, deliberate walk and in the faster amble, the hind feet are turned inward and are hardly raised, so that the soles slide over the ground. The front feet are lifted slightly and placed more deliberately, and the hindquarters sway from side to side at the hips in a graceful, if slightly comical, motion. Another gait, a kind of rocking gallop, is rarely used by an adult unless it is fleeing from danger. Both back feet strike the ground at the same time, followed by both front feet also almost simultaneously, and the wombat can cover a considerable distance at a surprising speed. It can also move quite quickly at a purposeful, heavy-footed trot, and often uses this gait when about to engage in hostilities. It moves up and down slopes with little change in speed, but sometimes, if the slope is particularly steep, the wombat spreads its front legs in front of its body, tucks its hind legs forward and, sitting on its flat rump, slides down the slope. This manoeuvre is often performed on steep river banks, and wombat 'slides' can often be found on these, and also on snow slopes. When walking in soft snow, a wombat places its feet carefully and deliberately, packing the snow down with each step. When the snow cover is deep, the banks of streams are often the only places where the grasses are not buried under the snow, and the slopes leading to these banks are usually well furrowed by wombat chutes. Wombats are also efficient swimmers over short distances. With the heavy body two-thirds submerged and the head tilted back to keep the nostrils clear of the water, the short legs 'dog paddle' under the water. There is no splashing and all an observer sees is an apparently floating wombat moving slowly and silently through the water.